Getting the natural tan from outdoor treatments can be time-consuming, discomforting, and temporary. People from different cultures seeking solutions on tanning their skin are growing inclined towards products that facilitate skin tanning indoors. The demand for self tanning products continues to gain traction as cosmetic companies strive to make the skin tanning process more comfortable and convenient for the consumers. By using distinct odors, specialized chemicals, and healthy ingredients, cosmetics companies are enhancing their range of self tanning products. According to Transparency Market Research’s recently published report, the global demand for self tanning products is poised to expand steadily at a CAGR of 5.3%. The report further projects that by the end of 2026, nearly US$ 5.5 Bn worth of self tanning products will be sold globally. The study has assessed a range of factors influencing the growth of the global self tanning products market. Among which, the growing importance of tanning in controlling the global incidence rate for non-melanoma skin cancer is expected to bolster the demand for self tanning products in the foreseeable future. The study also projects that proactive lifestyles of consumers will bar them from outdoor tanning, which will translate into higher demand for self tanning products during the forecast period. The report estimates that majority of products being sold in the global self tanning products market will be in the form of creams and lotions. 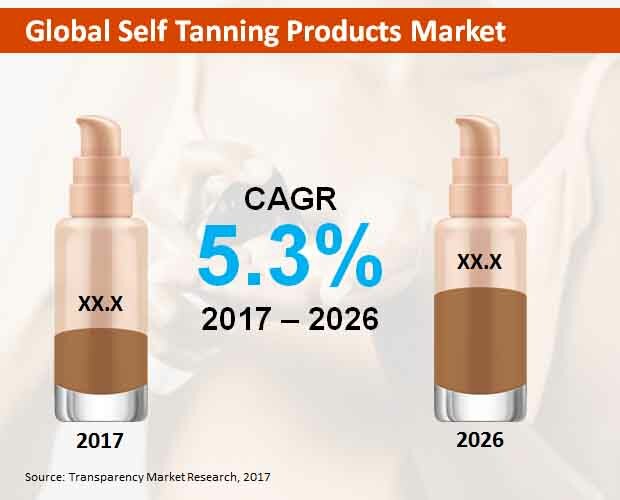 Easy applicability of self-tanning creams and lotions will fuel their global sales, and consumers were continue to be predominantly inclined towards them through 2026. By the end of the forecast period, creams and lotions being sold in the global self tanning products market will bring in an estimated US$ 3.7 Bn revenues. The report further reveals that female end-users of self tanning products will be relatively high than their male counterparts. Over the forecast period, more than three-fourth of self tanning products being sold globally will be used by women. The demand for self tanning products among male will lose traction towards the end of 2026. In 2017 and beyond, majority of self tanning products sales will remain concentrated in the modern trade segment. The modern trade outlets will account for more 40% of sales recorded in the global self tanning products market throughout the forecast period. Online sales of self tanning products, on the other hand, are expected to register fastest revenue growth at a CAGR of 7.3%. The report further reveals that majority of self tanning products will be sourced from conventional methods. This will entail the presence of synthetic ingredients in the production and formulation of self tanning products. By the end of 2026, more than two-third of self tanning products being produced in the global market will be sourced from conventional methods. The report also projects that Europe will remain the largest market for self tanning products in the world. Through 2026, the self tanning products market in Europe is poised to expand robustly at a CAGR of 6.2%. Companies at the forefront of global production of self tanning products have been profiled in the report. These include, L'Oréal S.A., Beiersdorf Aktiengesellschaft, Johnson & Johnson Services, Inc., Avon Products, Inc., Kao Corporation, Shiseido Co.,Ltd., The Procter & Gamble Company, The Estee Lauder Companies Inc., Unilever PLC, and Christian Dior SE. A majority of these companies will continue to focus on extending the product lines in the luxury segment. Changing personal care needs of consumers continue to influence the growth of the global cosmetics industry. Common skin care treatments such as tanning are witnessing a considerable transformation with respect to convenience. Consumers are actively adopting self tanning products to get the natural tan through indoor home sessions. While outdoor tanning processes is time-consuming, harmful and discomforting, professional tanning services are expensive. In the view of this backdrop, the demand for self tanning products continues to gain traction. Manufacturers of personal care and skin care products are focusing on boosting their presence in the global self tanning products market. The competition landscape in the global self tanning products market continues to be riddled with aggressive marketing strategies that are creating entry barriers for emerging players. Moreover, each self tanning products manufacturers is aiming at capitalizing the consumer trend of using luxury and premium products for personal care. Transparency Market Research’s new report on the global self tanning products market has assessed such factors, and developed insightful forecast for the period, 2017-2026. The report has analyzed the global self tanning products market on the basis of their pricing, consumer preferences, market strategies, raw material procurement, supply chain statistics, and production cost structure. The analysis has been conducted on several other parameters that gauge the potential of industry trends and macroeconomic factors in influencing the growth of the global self tanning products market. The report provides inferences that are aimed to deliver unbiased information to the manufacturers and help them understand the undercurrents of expanding business in the global self tanning products landscape. Key chapters in the report provide segmental analysis and forecast on the basis of types of products, end-user, sales channel, source, and region. Addition information has been offered in the report to reveal country-specific forecast and cross-segmental analysis. Transparency Market Research has developed the report by employing a slew of primary and secondary research methodologies. Key market participants have been interviewed and profiled in the report. A detailed competition assessment offered in the study aims at categorizing the presence of each company in the overall manufacturing landscape. From emerging players to industry leaders, companies have been profiled in a balanced manner. The report serves as a credible business document that can enable these players in planning their next steps towards future market direction. The report has been quantified in US dollars (US$) to capture the universal assessment. Moreover, metrics such as compounded annual growth rates, absolute dollar opportunities, and revenue share percentages have been used to interpret the market size estimations. The report has channeled the knowledge of industry experts, trade analysts and research consultants in creating first-hand information that can deliver insights on how the demand for self tanning products will shape up in the near future. Companies can avail this report to use the inferences in planning their strategies with respect to product development or entering untapped markets. The scope of the report is to help companies follow a guided path of business document without adopting drastic leaps, and maintain a secure position in the future of the self tanning products market.